Let your council member know what you think. The hearing is Tuesday November 10, 2015 Item 5.2. What’s a city to do when civic leaders express embarrassment at the number of homeless in downtown’s St. James Park? San Jose proposes taking $9 million of park development money and using it to “activate” the park for the next 10 years. A Knight Foundation grant paid for activities for the past two summers. Park staff suggests using the money for concerts, food trucks, family-friendly activities and more ranger hours — all to attract people other than transients to St. James Park. Others suggest using the money for housing or social workers. The City Council will decide Tuesday. There’s just one problem: The funding would come from an accounting sleight of hand that prevents the money from entering the Park Trust Fund. The fund is a state-authorized method for park and trail acquisition, major rehab and major repairs near the housing developments contributing to the fund. Under the proposal, developers near St. James Park would pay a discounted Park Trust Fund fee and a “voluntary” amount to a different account that could be expended on anything, depending on a sitting council’s whim. If all the money went to the Park Trust Fund, it would help complete four trails near enough to the St. James Park area to be eligible for the money. Progress on them has been stalled for lack of money after a decade of allowing developers to pay discounted park fees for downtown development, which the city wanted to stimulate. San Jose’s Envision 2040 General Plan calls for a mode shift away from cars, and trails are a key component. The city’s Green Vision to reduce greenhouse gasses calls for 100 miles of trails by 2022, and only 56 miles have been built. Park Trust Fund fees are needed to acquire and construct these long-planned trails and match state and Federal grants. In addition, other projects such as the long-planned Roosevelt gym depend on Park Trust Fund dollars from the St. James area. If these monies are diverted to activities, the publicly vetted and approved plans for parks are thwarted. Little outreach has been done on this plan to divert Park Trust Fund money. There’s been no city outreach to the people who use and care about trails, nor to the residents of District 3 who won’t be seeing their promised projects anytime soon. The proposal specifics didn’t surface until last Friday. Homeless activists vocally remind the city that the homeless are residents and have a right to be in St. James Park. And no one is talking about what to do about parks such as McLaughlin and Lone Bluff Park, where homeless encampments have recently sprung up — rangers, police and park maintenance staff don’t go there frequently. Parks all over the city need more attention — not just downtown’s St. James Park. The city needs are greater than that. If activation and a higher level of maintenance is good for St. James Park, then it is good throughout the city. Part of the park department staff proposal for St. James long term is establishing a park district to provide more flexible funding. San Jose needs to look at this citywide. The park department staff is recommending moving in this direction. This is the visionary solution to all of our park needs. Diverting Park Trust funds for St. James Park is a shortsighted band-aid. 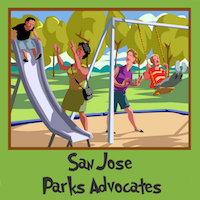 Jean Dresden is the founder of San Jose Parks Advocates. She wrote this for this newspaper.